Perhaps Windows Explorer said it best to me today – when I went to save the picture that accompanies this, it listed the rest of my output as “A long time ago”. And perhaps now is a good time to change that. For some time I have been struggling with finding my voice again – rediscovering what it is that I want to say. Some recent transitions have been surprisingly harder than I thought – and I have found myself wrong footed again. There have been a number of passages that have held me accountable and given me hope, and I find myself puzzling my way forward as I learn simply to breathe, simply to experience, simply to allow what is to be there. Our wise friend Lao-Tze said “If you want to become knowledgeable – learn one thing a day. If you want to become wise – unlearn one thing a day” – and that has in some ways been my experience, as I find what I thought I knew disappear to be replaced with a greater sense of simplicity and of ‘all is well’. There is much in the world at present that saddens and dismays me deeply. And yet I find myself certain of something unseen, something that is deeply, radically different. One of the quotations that’s been on constant replay for me is a series from a fabulous book of hope and promise in the face of change, “The Age of Miracles” by Marianne Williamson. I leave it here for you to ponder: while I find ways to step into a new experience and a new expression of Life. “The pulse of the moment – both personally and globally – is to let go of what needs to be let go, to disenthrall ourselves of what used to be, and embrace a radically new kind of life. The magician, the alchemist, the miracle worker, is simply someone who has woken up to the material delusions of the world and decided to live another way. In a world gone mad, we can choose to be sane. 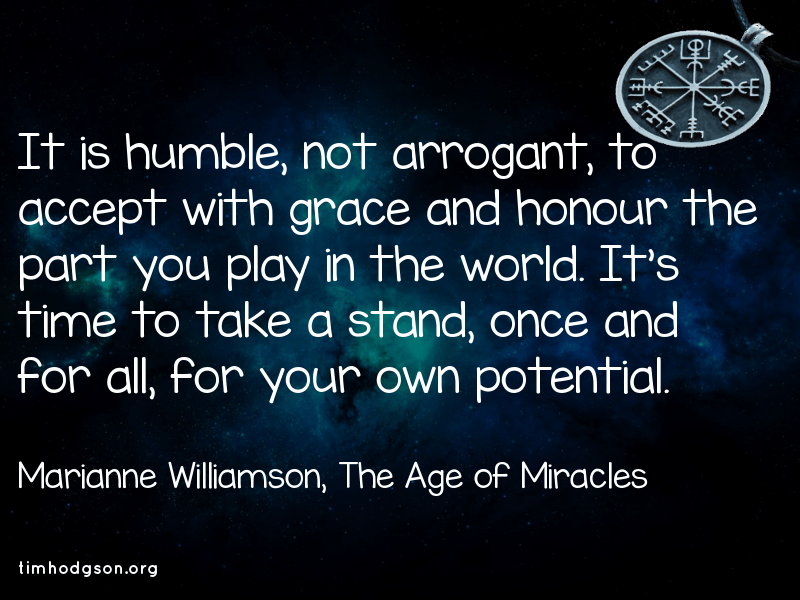 Marianne Williamson, The Age of Miracles. I’m working on taking that stand – will you join me? This entry was posted in Wisdom by Tim Hodgson. Bookmark the permalink.